Recounted below are some of the true experiences that our partners have had while working with Tait products. If you have a Tait Tough story too, please contact us. 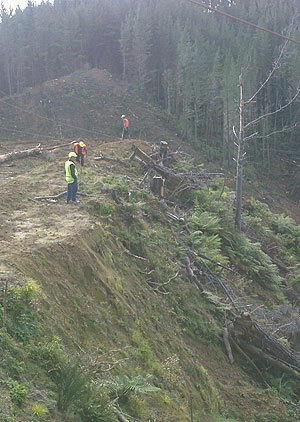 It was the end of a wet and miserable winter's day for a forestry gang working on the East Coast of New Zealand. The "Breaker Outers" decided that rather than carry their backpack with equipment and VHF Tait portable radio they would clip it onto the "Skyline" (the wire rope connected to the Hauler that pulls the trees back up the hill). All was going well until half way across the Skyline jerked, causing the backpack to flick and the radio slipped out of the backpack and fell to the ground about 20m below. As luck would have it, it was above the creek running down the valley, and with all the wet weather the creek was running high, and combined with the forest slash was full of large ponds. The radio landed in one of these ponds, and while the crew saw where it landed they were unable to locate the radio, despite swimming in the pool, they determined it was deeper than 2 meters. Several months later the foreman was again in the area, the weather fine and the ground had dried out. They had tied a marker above the pool so it was easy to locate the area, and with a bit of digging he was able to easily spot the bright yellow Tait radio in amongst the rubble. The radio was brought back to Colvins Workshop, a quick clean-up and a new battery and it was fully operational again. One very happy customer! "Dropped 20 meters… only minor cosmetic damage"
While on a recent trip to one of our remote radio sites on the east coast of Tasmania we thought it might be a good opportunity to see for ourselves how tough the Tait portables really are. We decided to drop our portable off the lookout tower at Tower Hill to the rocks 20 meters below. As can be seen by the video the radio bounced off the rocks but survived suffering only minor cosmetic damage, the radio is fully operational. We have a great Tait Tough story to share from a new project deployment for one of the biggest American Oil and Gas companies in Indonesia that finished around 2 months ago. On Monday morning, 14th of September 2015, an email came through, reporting an incident that had happened on the day before. A user had dropped his Tait portable into a watery mud puddle and he didn't have time to grab it before a heavy equipment vehicle come through and ran over the radio. Amazingly, despite a broken antenna, the radio itself is still in good condition with only a few scratches. We only needed to replace the antenna and it was working again. Tait Tough - It's so true. Thanks for the perfect quality. Happy Tait spirit! Earlier this year I sold a TP9435 to the Spearsville LA Fire Department. This summer the radio was inside a house that caught fire and burned. The antenna was badly burned, the belt clip and the control knobs received heat damage. It is very obvious that this radio got hot. The cord on the speaker mic was also melted. Yet, this radio still boots up and logs onto the system and has been tested and it still works. I was walking up the stairs of a Dragline boom for urgent maintenance work, the stairs are fairly narrow. The supervisor I was working with from the mine was carrying a TP9100 portable. Approximately two thirds of the way up the boom his radio aerial caught on the handrail support, pulling the radio off his belt. The radio then fell through the stairs, bounced off three steel frames in the space of five meters. The radio then continued to fall approximately 30 meters straight to the very rocky dirt, recently spilled by the dragline. After completing some of the repairs, we went searching on the ground for the radio. To my and the supervisor's surprise the radio was only in 2 pieces (battery and radio), and appeared to be otherwise ok. Please note the battery and radio were spread 3 meters apart from the impact. After a quick dust off, I clipped the battery back on and heard the standard Tait start up tone. I quickly checked the keypad, dials, got a radio check and handed it back to the supervisor who had a very surprised look on his face. "All in a day's work… nothing special!" Well, what could be the stories in a silent environment of professionals in radio communication, safety and industry? Nothing special. 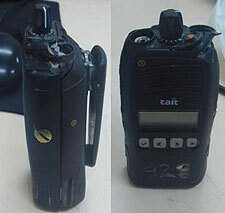 Tait radios have fallen off a cliff in Caucasus mountains, dropped out of the hands of the users from the car on the move, were exposed under the hard rain and remained under the snow, being charged with an inadequate voltage, being programmed by quite untrained personnel, and they are even been used for various other purposes (yeah, just normal usage as hammer etc.) So, what? Nothing happened, ever (seems that we have to try again-and-again:). These instruments work as a real and correctly made products should, ensuring smooth and reliable communication. That's all, folks! "48 hours in the sea!" One of our users dropped a TAIT portable radio into the sea. The radio was recovered after 48 hours in the sea, and while the radio PCB was not in a good condition, we did some cleaning with the help of a contact cleaner just to make sure that sea water did not remain inside the radio. We reassembled the radio and … you know what? … the radio was working fine, unexpectedly! Another user lost his portable radio and it was recovered after 6 months from the garbage. While the radio battery was dead, we just connected the charged battery and its start working again.